Congratulations, you’ve decided to move to New Jersey! This is an exciting time, but if you’re moving to New Jersey with a dog, it might also be a little stressful. It’s important to remember that just as you prepare yourself for a move, you need to prepare your dog as well. 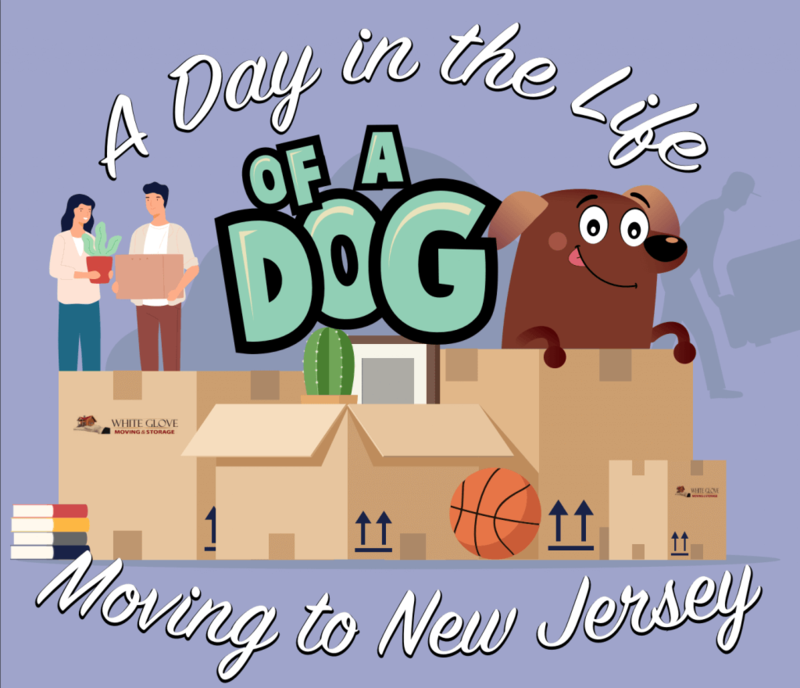 Read on to find out what goes into moving to New Jersey with a dog, and what you can do to make your move as smooth as possible. Because dogs have such strong relationships with their owners, they often feel their stress. This means that if you’re feeling anxious about your move to New Jersey, your dog will pick up on your emotions. It’s practically impossible to avoid stress during your move, but try to act cool and collected when you’re around your dog. This will help them feel relaxed and happy while you’re packing and making plans. Dogs are very dependent on their owners, and rely just as much on their daily schedules. They pay attention to the things you do every day—like the times you come back from work, feed them meals, and take them out to go to the bathroom. It’s understandable that, when you’re preparing to move, your routine may get shaken up a bit. To keep everything peaceful, keep as close to your dog’s regular schedule as you can. If your dog thinks that everything is normal, they’ll be more comfortable on the day of the actual move. If you know that your dog will need to stay in a crate in the car ride or in your new home, start preparing them now. Crates can be a difficult transition for your dog, especially if they’ve never been in one for a long period of time. To ease some of the shock and anxiety surrounding crates, start getting your dog used to them now by crate training them. Crate training usually involves putting your dog in a crate with their favorite toys or blankets for progressively longer amounts of time—but not more than a few hours. In the beginning, make sure you’re within sight of your dog so that they feel comfortable. If you start this training before your move, things will be a lot easier when you’re transitioning to your new home. It’s important to always keep your dog up to date on their vaccinations, especially before a move. You might also consider having your dog microchipped, if they aren’t already. This can save you some serious worry when you’re traveling and adjusting to a new city with your dog. It can take time to find a vet you trust in your new city. Before you leave, ask your current veterinarian if they know a good vet in New Jersey. It’s also a good idea to have the number for an emergency vet on hand, just in case something happens during your move. If you’ll be staying in hotels during your move, it’s worth knowing that not all hotels accept dogs. If you don’t do your research, you might find yourself and your furry friend rejected by inn after inn. It’s smart to do the research before your trip to know where you can stay, and to plan your travel around accepting hotels. Most hotels will list their pet policies online, but it’s worth calling ahead before you book to make sure your dog will be allowed in your room. And when you arrive at the hotel, check your room to make sure there aren’t any chewable hazards lying around to tempt your pet. Finding the perfect apartment or house is easier said than done—as is finding one that accepts pets. Even places that do accept dogs often require a pet deposit to cover damages, which may or may not be refundable. You may also need to pay a monthly pet fee on top of your rent payment. Before you make a final decision, take a look around your new place. Will it be easy to take your dog out on a walk? Is your dog young enough to easily navigate stairs? Answering these questions will make it much easier on yourself and your pet. The stress of moving cannot be overstated—but there are ways to cut down on that stress for you and your dog. When you’re getting ready to move, make sure you find the right New Jersey moving company to help you do so.The professionals at White Glove Moving & Storage have years of experience helping dog owners move to and from New Jersey. They’ll make sure your possessions and your dog’s favorite toys get to your new home safely and smoothly. Contact us today to see how we can help you with your move to New Jersey. Like most states, New Jersey has laws in place when it comes to dog ownership. The Veterinary Public Health Office requires that all dogs receive a license every three years. Dogs should have evidence of current licensure on their collars. Fees for licenses can vary depending on your county, but are usually around $20. In order to acquire your license, you need to be able to prove that your dog is vaccinated against rabies. If your dog isn’t already vaccinated, it’s a good idea to get that done before you move, as it’s easy to overlook once you get to your new place. And remember, rabies vaccines also need to be updated regularly, so be sure to stay on top of your dog’s vaccination records. Once your dog has adjusted to their new home in New Jersey, it may seem like everything’s smooth sailing going forward. However, you never know how your dog behaves when you’re not home. It’s very common for dogs to feel a little bit of separation anxiety once they’re left alone in their new home. They might whine, bark, or scratch at walls or furniture after you leave. While this doesn’t really affect you much, your neighbors are likely to become annoyed very quickly if you don’t take care of the situation. However, there are ways to prevent separation anxiety before it even happens. When you first arrive at your new home, be sure to spend as much time as you can in your apartment with your pet. With you by their side, they’ll be more comfortable. This will give them the confidence they need to explore their new surroundings and start to feel more relaxed. If your dog is still showing signs of separation anxiety, take a trip to the veterinarian. They might be able to recommend medications or other methods to soothe your dog’s anxiety. One of the best things about moving to a new city is exploring all of the new places you can go, and your dog most likely feels the same way. To explore your new neighborhood, take your dog out on walks and take in the scenery. Visit some local cafes, introduce your dog to some neighbors, and familiarize them with their new surroundings. However, be careful not to show them too much too quickly. Dogs can get overwhelmed by too many new things. Introduce them to your new neighborhood bit by bit, and introduce them to new people and dogs carefully and slowly. While you might enjoy your new apartment, dogs tend to get a bit restless after a while. To help your dog get their energy out, research your area for dog parks or even regular parks close to you. Every so often, take your dog to a park to let them run around, socialize, and enjoy their new city. Parks can also help break up the monotony of taking your dog on their usual route to go to the bathroom. And you might make some new friends, too! By now, you’ve learned the basics of moving to New Jersey with a dog. While it seems intimidating, things will go a lot more smoothly if you start preparing before your move. To learn more, take a look at our infographic about moving to New Jersey with your four-legged friend. Be sure to check out our services page to learn about ways White Glove moving can make your move easier.